Pastures need time to recover following prolonged drought or a series of poor growing seasons. Grazing systems that allow for pasture spelling, deferred restocking, continued drought feeding and prompt weed management are all tools to help achieve pasture recovery. The basis of our pasture systems are perennial tropical grasses, both native species and exotic ‘sown’ species. The presence of productive, palatable and perennial (3P) grasses is a major indicator of land condition and productivity. Pasture management decisions should be aimed at promoting the growth and population of these grasses. To promote new growth following a spring or summer break, perennial grasses draw on reserves of energy and nutrients stored in their root systems. They use these reserves to grow new leaf. Only when they have sufficient leaf area does photosynthesis take over the role of providing energy for continued growth. A tussock needs to be growing for about six weeks following rain reach the stage when photosynthesis takes over. If the tussock is not growing for some of the time during this period, then it will take longer to produce sufficient leaf and the photosynthesis stage. In the photo below, the black speargrass tussock on the left has been clipped about three times during the growing season; the one on the right every 2-3 weeks to stimulate continuous heavy grazing. Continuous overgrazing in the early phase of growth depletes stored root reserves and eventually weakens the tussock. It is also in this fresh growth stage that the feed quality is highest. Digestibility can be as high as 70% and provide nearly 10MJ ME/kg DM. Protein also is at its peak and in some grasses on better land types can be as high as 20%. This means that the cattle growth rates are potentially as high as they can be. In fact the only thing that will limit production is the low yield and high water content restricting intake. However, the down side of grazing these tussocks in this early phase of growth is that the tussock is forced to keep drawing on stored root reserves. If the grazing is severe enough for long enough, the tussock becomes less vigorous and can die. This poses a dilemma for graziers; the key component of their production systems, the 3P tussock, is most susceptible to grazing at the same time that it is most nutritious as feed. In most years where rainfall is near or above average, and providing stocking rates do not exceed long term carrying capacity, the selective overgrazing of individual tussocks during the first phase of growth is not an issue. 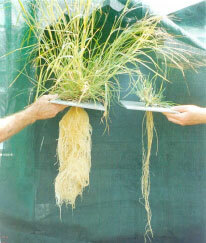 The tussock should be healthy with sufficient reserves in a vigorous root system. However, consecutive seasons of poor rainfall or extended drought often mean the 3P tussocks are already under stress with depleted root reserves. This is especially the case where the preceding growing seasons were below average and consisted of several minor falls of rain. Grazing management that allows for pasture spelling during the early phases of growth ensures the 3P tussocks have time to replenish their root reserves. This is especially important during drought recovery. Large paddocks can be spelled for a significant period of the growing season. An example of this is a four paddock, wet season spell where each paddock gets spelled for a full wet season spell once every four years. Smaller paddocks can be spelled for shorter periods by rotation. Rotation systems for smaller paddocks include an intensive cell system where cattle move through small paddocks in a few days or a less intensive system where they move through larger paddocks in a couple of weeks. The critical aspect of these systems is ensuring that cattle don’t come back into a paddock for around six to eight weeks. Avoid restocking immediately following useful rain. Where stock numbers have been reduced due to drought, delaying restocking allows pastures time to recover. If the ‘break’ to the season turns out to be a false one, you are not left with the problem of trying to feed expensive stores on pastures that continue to be stressed. Continue drought feeding for a few weeks in smaller paddocks if possible as this will allow larger paddocks to be wet season spelled. It never rains grass and cattle can loose weight quickly chasing green pick. Maintaining an adequate plane of nutrition through supplementary feeding can offset this problem. The added benefit is that the grazing pressure on the pasture is reduced. Be on the ball when it comes to weeds. Stressed pastures are susceptible to competition from weeds. In some cases, strategic weed management to reduce weed density early can be a very cost effective way of ensuring pasture recovery.